It also received one strike of a NIZHNI - NOVGOROD 5 12 19 with three triangles at base. These are so clearly struck (as are the letters "NIZH.." that it is clear a brand new device is being used. 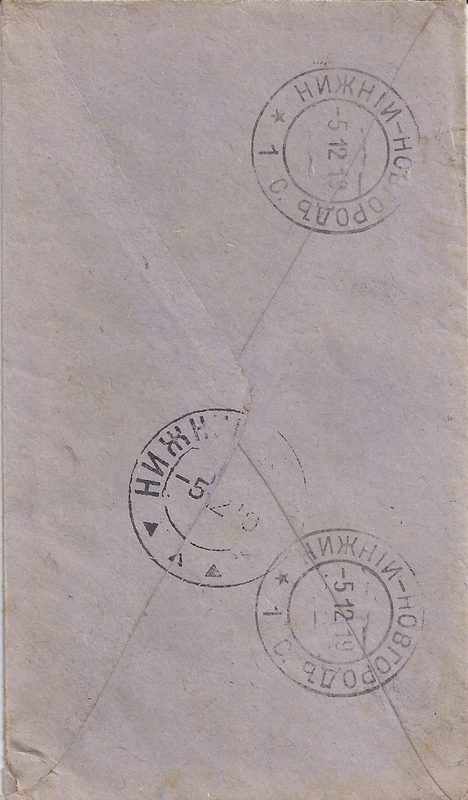 According to Taylor, the only other Three Triangle censor mark known used in 1919 is one from SARATOV used on 19 December 1919. 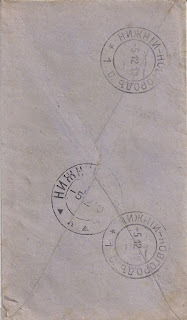 Trevor, the Nizhnii machine postmark is legit, it just has a weird inscription, suggesting it was at the 1st (sub-? )office, and has serial letter "S". It was in use at least since 1915. Also nice about the Nizhnii 3 Triangles marking is that it was Nizhnii in the new spelling.